Richardson attended the University of California, San Barbara, from 1980 to 1981. She graduated from the University of California, Los Angeles, in 1984, with a B.A. in political science. Richardson later received her M.B.A. from the University of Southern California in 1996. She worked a variety of private sector jobs—as a marketing director of a document managing company, the owner of a customized clothing company, and a teacher—before she became a field deputy in Congresswoman Juanita Millender-McDonald’s southern California district office. Richardson also worked as an aid to California Governor Cruz Bustamante. In 1996, Richardson attempted to start a political career of her own when she unsuccessfully sought a Democratic nomination for the California assembly. She won a seat on the Long Beach (California) city council in 2000, having narrowly defeated a popular local sports star by a scant six votes.4 She served in this capacity for six years before she was elected to the California assembly in 2006. 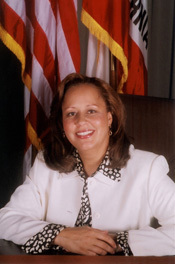 On April 21, 2007, Representative Millender-McDonald, died after a long battle with cancer. Richardson was one of 18 candidates for the June 26 Democratic special primary election for the vacant House seat.5 The district covered low- to middle- income sections of Long Beach, Los Angeles, Compton, and Carson, including coastal areas known for shipping and manufacturing.6 With an 85 percent minority population, the district—once considered safe for African-American candidates—was primarily Hispanic.7 The three top candidates included Richardson, Millender-McDonald’s daughter, Valerie McDonald, and Hispanic state senator Jenny Oropeza.8 Richardson’s support came primarily from the African-American community, organized labor, and the pro-choice group EMILY’s list. She prevailed with a plurality of 37 percent of the vote. In the heavily Democratic district, Richardson handily won the August 21 special general election with 67 percent over GOP candidate, Long Beach police officer John Kanaley.9 Richardson was sworn in to the 110th Congress (2007–2009) on September 4, 2007. Richardson inherited Millender-McDonald’s assignment to the Committee on Transportation and Infrastructure, a panel on which she would serve her entire congressional career. She also picked up a seat on the Science and Technology panel, but traded that post for a seat on the Homeland Security Committee for the 111th and 112th Congresses (2009–2013). In early 2010, Richardson was appointed chair of the Homeland Security Subcommittee on Emergency Communications, Preparedness, and Response, a position in which she served for the remainder of the 111th Congress (2009–2011). In late 2010, she was elected to the influential House Democratic Steering and Policy Committee, which determined party strategy. 1Politics in America, 2010 (Washington, D.C.: Congressional Quarterly Inc., 2009): 143; “Congresswoman Laura Richardson Launches General Election Campaign,” 20 September 2012, Sentinel (Los Angeles, CA): A6. 2John Canalis, “Father of Rep. Laura Richardson Dies,” 13 May 2008, Long Beach Press Telegram: n.p. 3Politics in America, 2010: 143; Justin Fenton, “A Cop Who Engages,” 23 September 2012, Baltimore Sun: 1A. 4Politics in America, 2010: 143. 5This number includes a write-in candidate. John L. Mitchell, “Two Favorites Emerge in Race for Congress,” 25 June 2007, Los Angeles Times: B1. 6Politics in America, 2010: 143. 7John L. Mitchell, “Two More Enter Race for 37th District,” 3 May 2007, Los Angeles Times: B1. 8Josh Kraushaar, “Black Vote Edges Out Hispanic Vote in Battle for Calif. District,” 28 June 2007, Politico: 14. 9Mitchell, John, “Democratic Legislator Wins Congressional Seat,” 22 August 2007, Los Angeles Times: B4. 11Congressional Record, House, 110th Cong., 2nd sess. (27 September 2008): H10142. 12Politics in America, 2012 (Washington, D.C.: Congressional Quarterly Inc., 2011): 134. 13Hearing before the House Committee on Appropriations, Departments of Transportation, and House and Urban Development, and Related Agencies Appropriations for 2011, 111th Cong., 2nd sess. (25 April 201): 564. 14“Gerald Desmond Bridge Replacement Project,” available http://www.newgdbridge.com/default.asp (accessed 25 September 2013). 15Congressional Record, House, 112th Cong., 2nd sess. (26 June 2012): H4008–H4009. 17“Congresswoman Laura Richardson Announces $155 Million Homeland Security Grants,” 5 July 2012, Sentinel: A2. 18Jean Merl, “Battle Lines Form in State’s Races,” 18 March 2012, Los Angeles Times: A31. 19Jean Merl, “House Reprimand Just One of Hurdles Richardson Faces,” 10 August 2012, Los Angeles Times: A1. 20Committee on Ethics, “Summary of Activities: One Hundred Eleventh Congress,” 111th Cong., 2nd sess. (2 January 2011): 48–49, available http://ethics.house.gov/sites/ethics.house.gov/files/documents/Summary_of_Activities_111th.pdf (accessed 24 September 2013). 21Committee on Ethics, “Summary of Activities: One Hundred Twelfth Congress,” 112th Cong., 2nd sess., 31 December 2012: 51–54, available http://ethics.house.gov/committee-report/activities-committee-ethics-112th-congress (accessed 24 September 2013). 22“Election 2012; The Times’ Endorsements,” 14 May 2012, Los Angeles Times: A15; “Hahn in the 44th District,” 28 September 2012, Los Angeles Times: A20. "Laura Richardson" in Black Americans in Congress, 1870-2007. Prepared under the direction of the Committee on House Administration by the Office of History & Preservation, U. S. House of Representatives. Washington: Government Printing Office, 2008.